Here are just a couple of quick shots of Cross Creek. 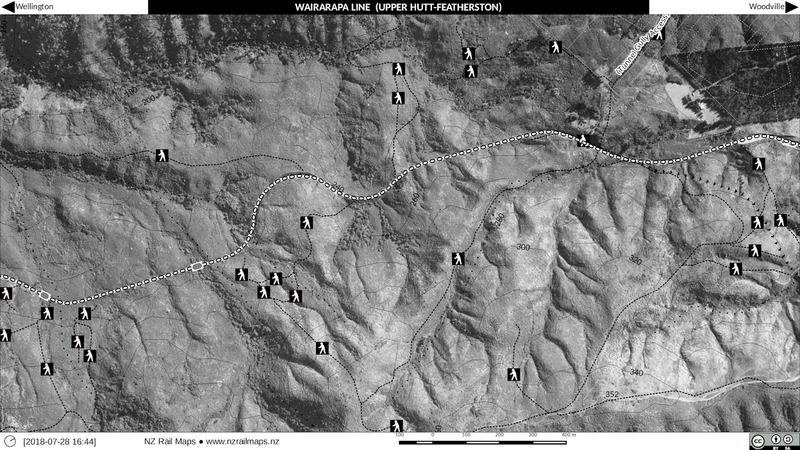 These have not been converted to tiles because the entire mosaic project is for Summit to Pigeon Bush as well as Rimutaka Loop and it needs more aerial photos that I couldn't get today because there were some issues with the Retrolens site. 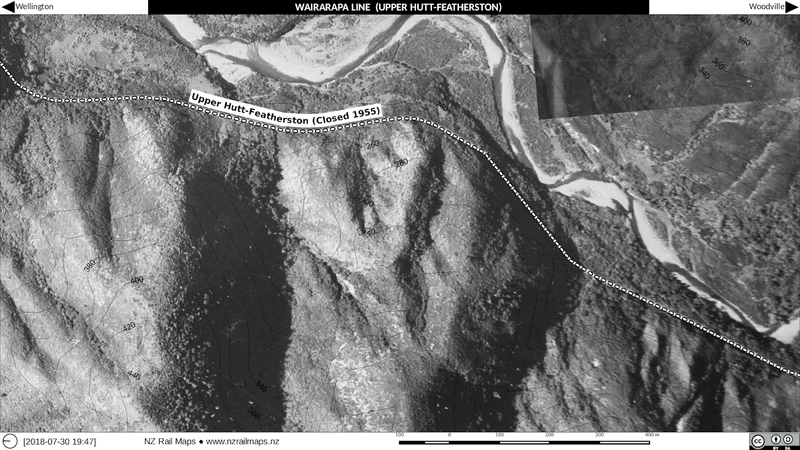 First image is taken after the line closed in 1961 so a lot of it is sites that may be vacated and contain ruins. 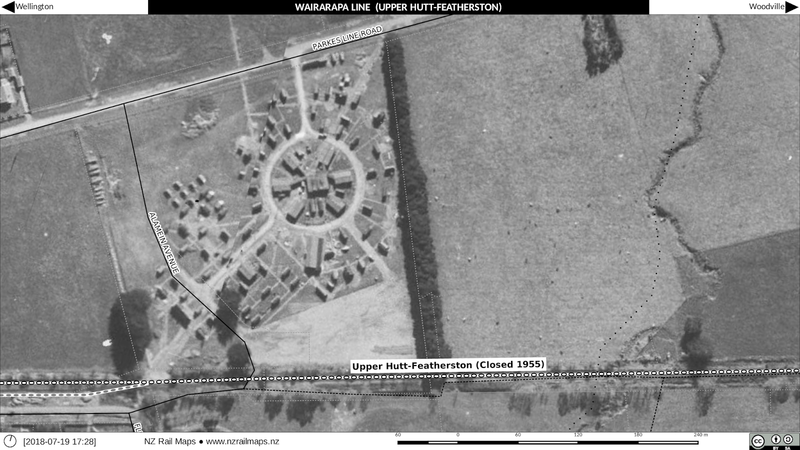 On the left is one of the actual houses that was still in place at this time as NZR simply put them up for sale and probably this particular one would have been hard to access so may have been demolished. 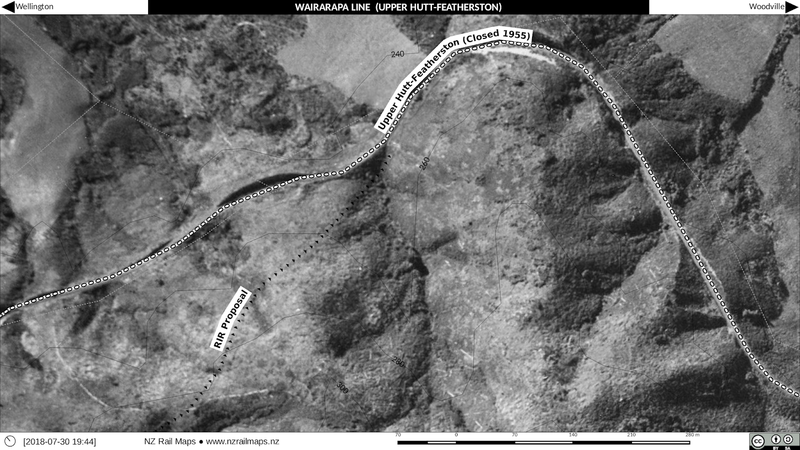 Somewhere there must be a diagram or more aerial photos that will give more detail of what was actually at Cross Creek when it was open. 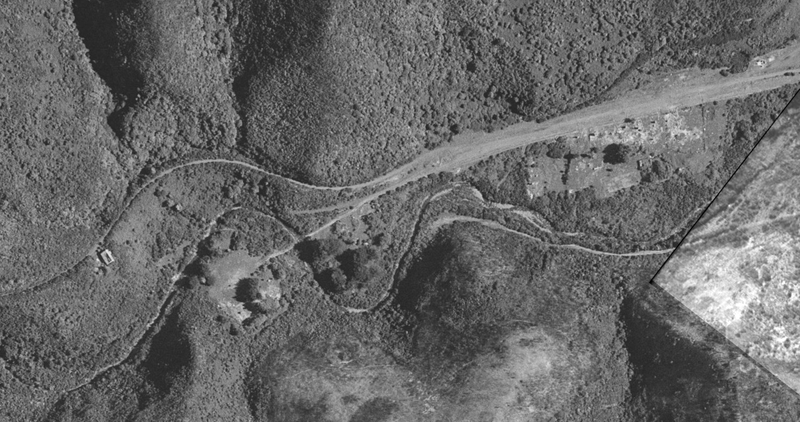 Considering there isn't as yet any aerials of Summit when open I was quite fortunate to be able to get half of Cross Creek from 1944 which is seen in this aerial, and mapping that detail will be good to do. 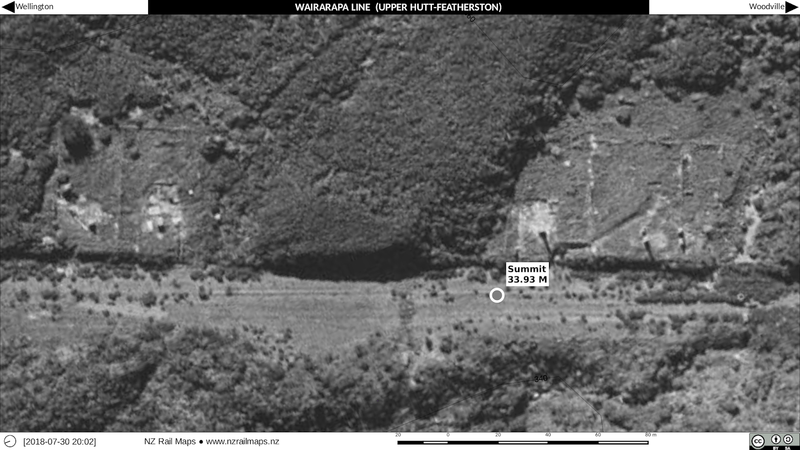 I will get the rest of the aerial photos for this area and probably there are one or two more posts depending on what is on them. The completion of the maps is some way off, later in the year, as I have a lot of other stuff on the go as well and really would like to turn my attention back to the Otago Central stuff and push that ahead. It has been very interesting taking this little diversion into Wellington over the past few months with the Tawa stuff I have been working on but now I just need to put it aside and finish off some of the other projects and then come back to it and push it along. 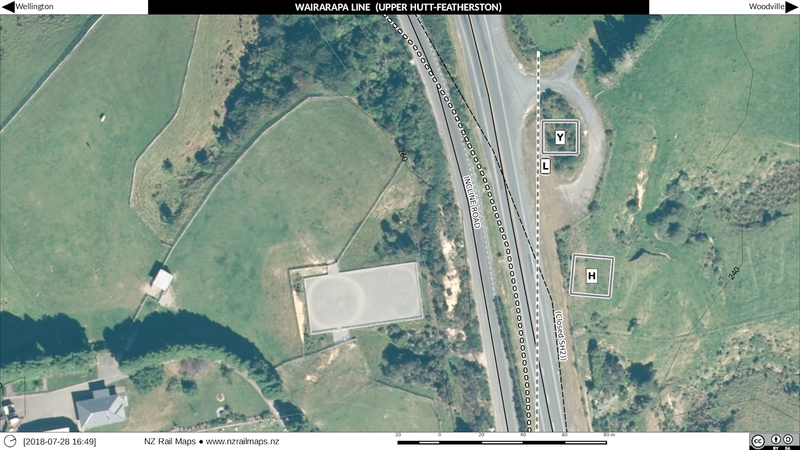 I think in all probability as far as North Island content goes I will focus on Wellington-Wairarapa-Napier-Gisborne since I have flagged already that I want to get the PNGL stuff sorted out but I may push out just a set of diagrams for Napier-Gisborne fairly soon rather than complete maps. These maps aren't complete sets like the previous ones and they haven't been marked up with detail like the maps generally would be. The reason for this is I am just working as fast as I can to get the rest of the Rimutaka detail done before I need to go and catch up some other stuff. In fact mostly what has been done is putting the aerials together but there is a lot of Wellington stuff that is not going to be finished right now but will come together later as I have all sorts of stuff on the go right now. So these are just the historical pictures (mostly 1943 but the one of Summit itself is 1961) without much detail added to them. I haven't got much in the way of captions except that one of them is Ladle Bend where you can see there was a house built at one time. The very last one is a closeup of Summit where you can see some of the sites but because this is 1961 then unfortunately there isn't an opportunity to fill in what was at those sites. 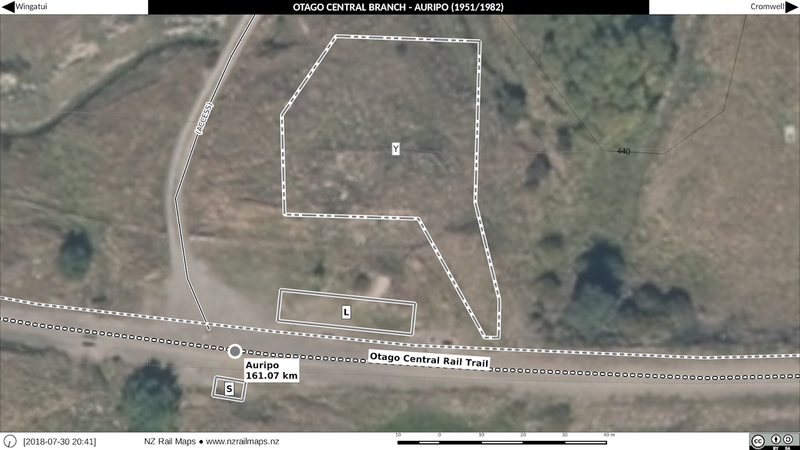 Here are the final maps for Auripo station. I now have to do the rail trail Google Maps coverage of Lauder to Auripo and mark in the peg locations and any other interesting detail on the maps. 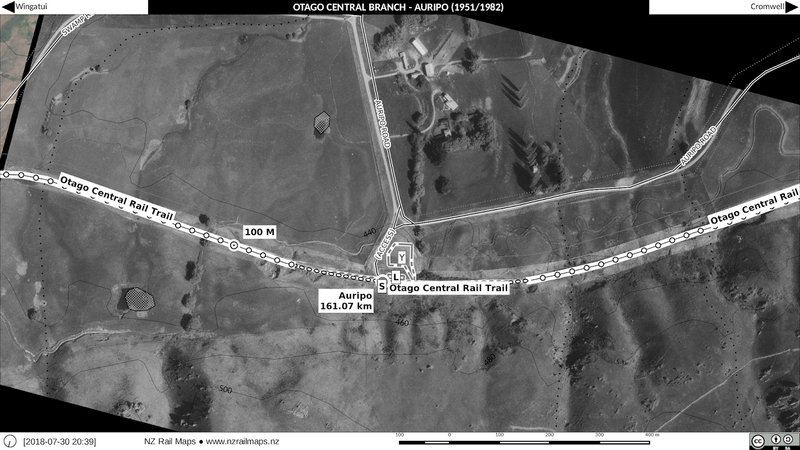 The only reasonable aerial coverage we currently have of Auripo is from 1982. You can see a bit of detail on that, and for that reason it was used as the historical background for these maps. 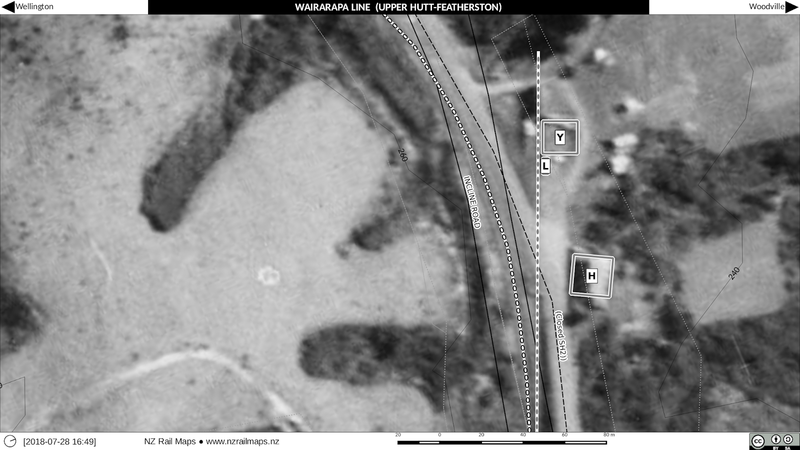 However, because the station was closed when it was taken, you can't see where the station building actually was. The track of the loop was still in the ground then, as it was common to leave the old track in place and only remove the point blades and frogs off the mainline at each end. However the disused sidings and sleepers were removed when the line was lifted in 1990/91. 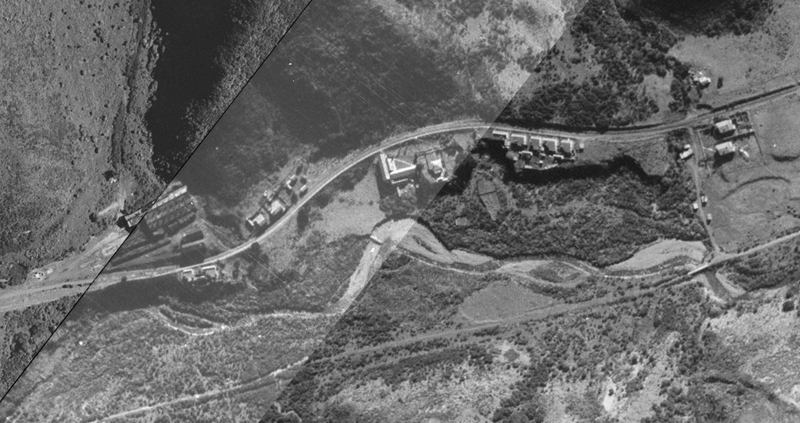 Aerial coverage should exist in Survey 112 which I think is from 1939, but has not yet been scanned by LGGA. When that finally arrives the maps will be updated with it. 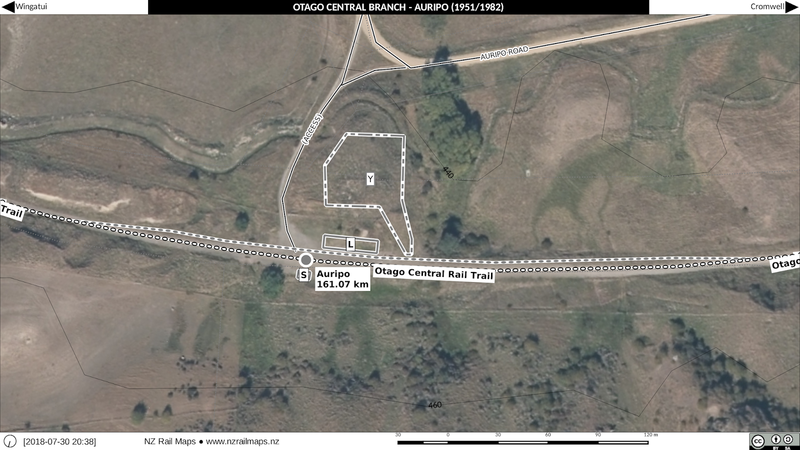 I don't know if there were even any houses at Auripo or if it was an unattended flag station for most of its life. 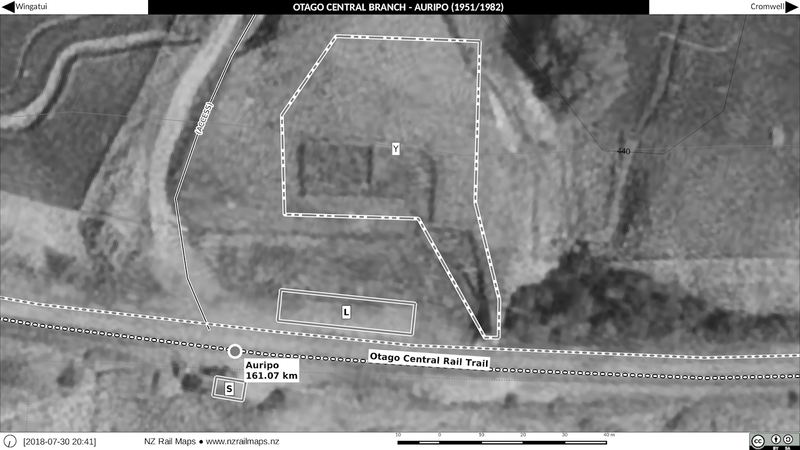 Overview of Auripo. It was a very small station in the middle of nowhere and it is surprising that it stayed open as late as 1978. The end of the railcar service was the nail in the coffin. 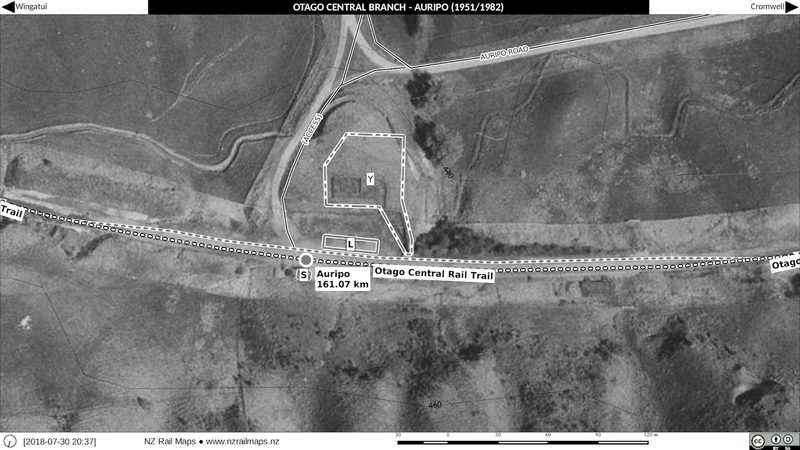 Auripo only had a loop siding, stockyards, loading bank and shelter. The loop was extended in the 1950s. The stockyard was on privately owned land. Closeup view of the station facilities. Nothing is left at this site today. 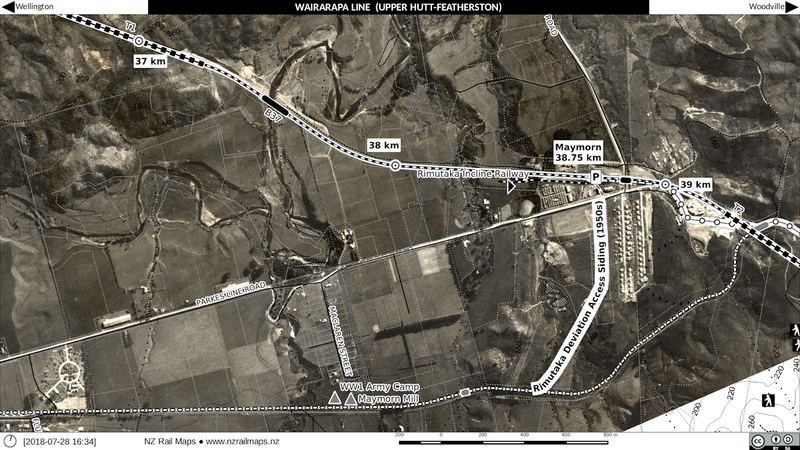 This post contains a large number of maps because there are also some from 1951 and 1958, which are the periods immediately before and after the opening of the Rimutaka Tunnel deviation. 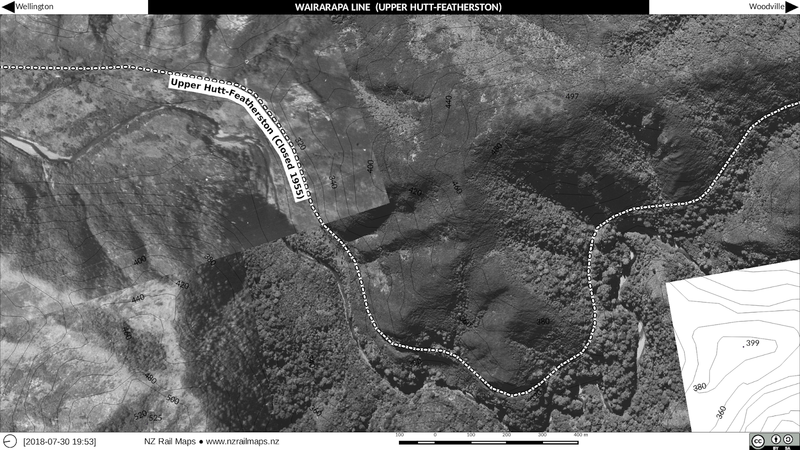 Using the WTT data I have obtained the mileages that should be the correct ones for Mangaroa through to Pigeon Bush. 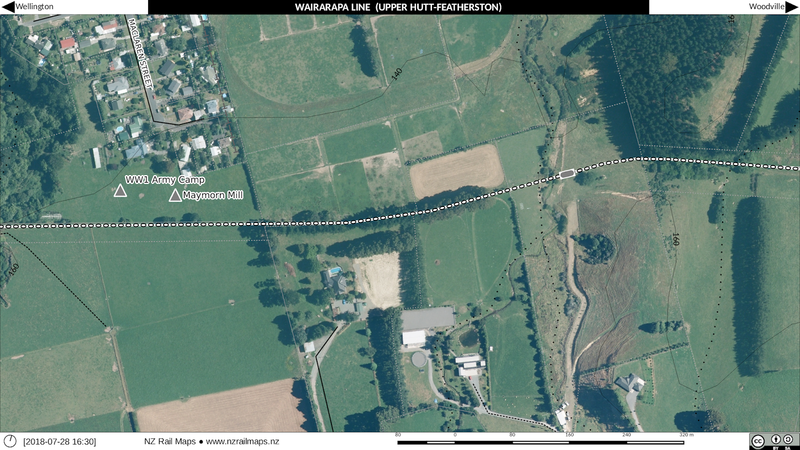 It is interesting to note that the actual distances would have changed not long before the deviation opened because the old Hutt valley line up the western side (now cut back to Melling) was bypassed itself at the beginning of 1954. 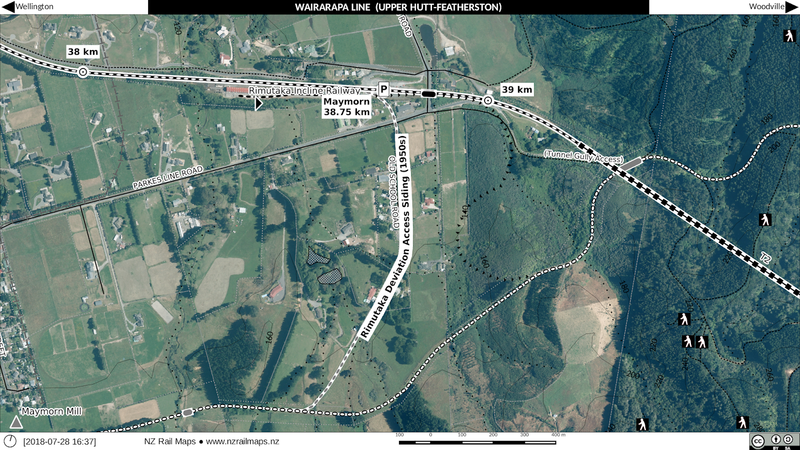 This resulted in distances from Hutt Valley Junction to Haywards increasing slightly because the new route was longer, although the opening of the Silverstream deviation just four months before Rimutaka would have reduced distances somewhat. 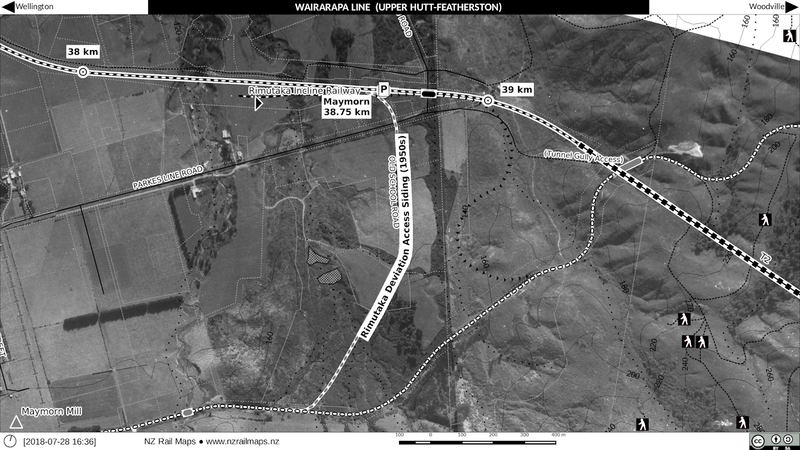 The 1947 WTT shows Upper Hutt being at 19 miles 37 chains from Wellington. However in 1971 the distance was recorded in the Way and Works district boundary diagrams that I have as being 20 miles 19 chains, which would account for the increase. 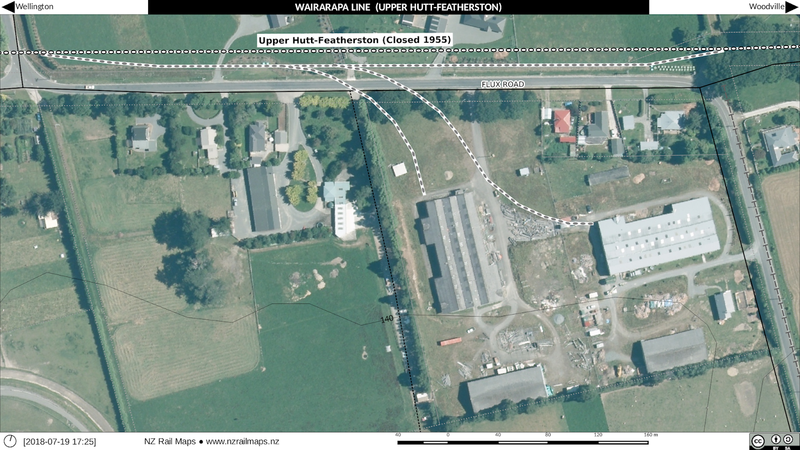 I stuck with the earlier measurement as it seems unlikely the railway north of Upper Hutt would have been remeasured for such a short period of time before it closed. 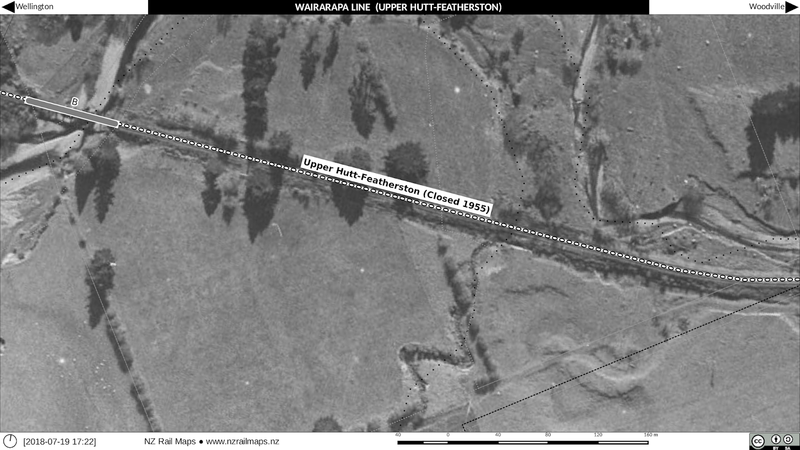 It does seem however the entire section from Haywards to Upper Hutt was remeasured if this new distance was obtained. 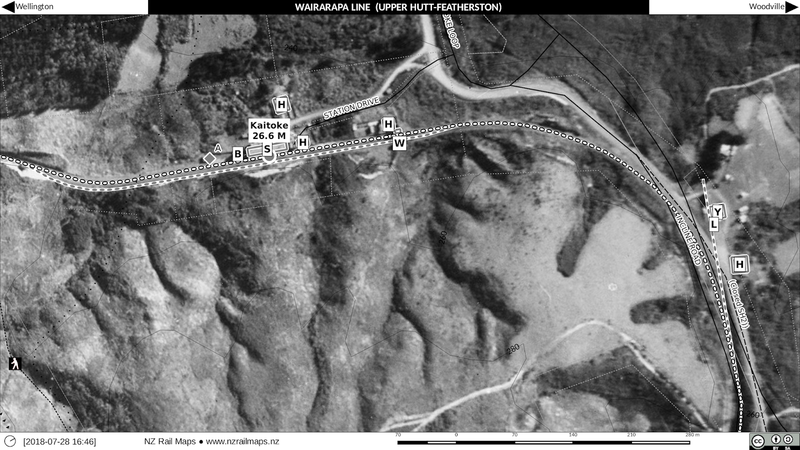 Certainly it would have been necessary to put in new distances for the stations on the Hutt Valley line, and for the Rimutaka Deviation, so it seems that may be how the new distances came to be obtained up to Upper Hutt. 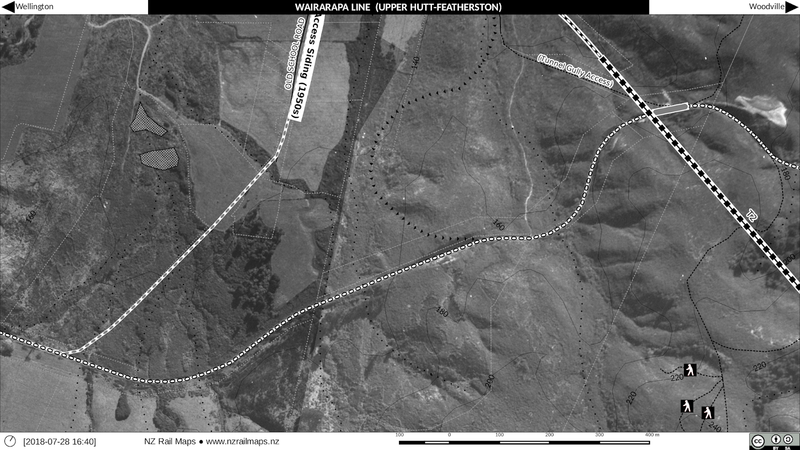 However even in 1971 when the Way and Works chart was prepared, the junction point entailed a gain of around nine miles given how much shorter the Rimutaka Deviation was, and so the mileposts from there north were not altered, making Featherston on paper 24 miles from Upper Hutt instead of the 15 miles it actually was once the deviation had opened. 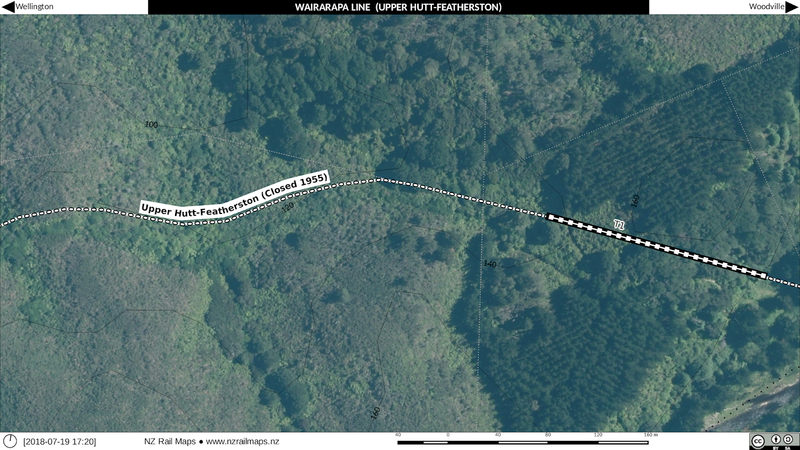 My position on station distances has and remains to record the last official distance stated for a particular station. In many cases this does not line up with kilometre posts of today because of remeasurement from scratch being the means to obtain the distances at metrication. This is why I keep the mileages in miles instead of converting them to kilometres because they give a misleading relationship to the present day metric measurements. 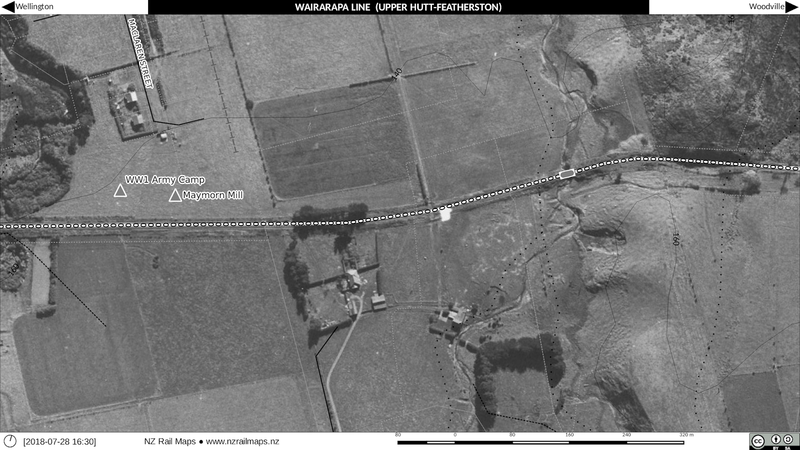 One of the most interesting things about the "Rimutaka Railway" (the title used in an NZRLS book I have) is that it was a 19th century railway that survived past the middle of the 20th. 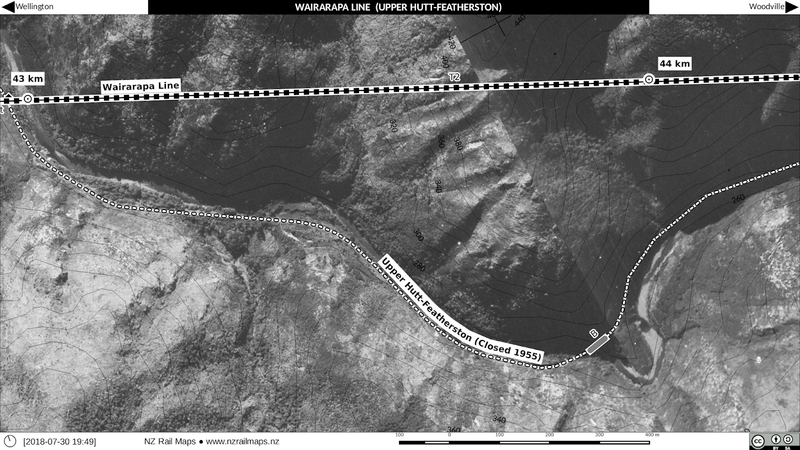 There were absolutely no improvements done anywhere except for a curve easement at Summit. 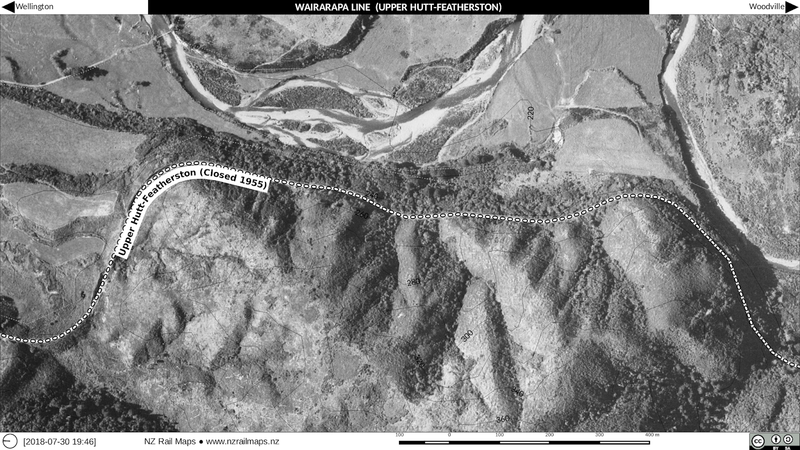 Hence it was still being worked right to the end with the steep 1 in 35 grades and the sharp and numerous curves down to 100 metre radius. 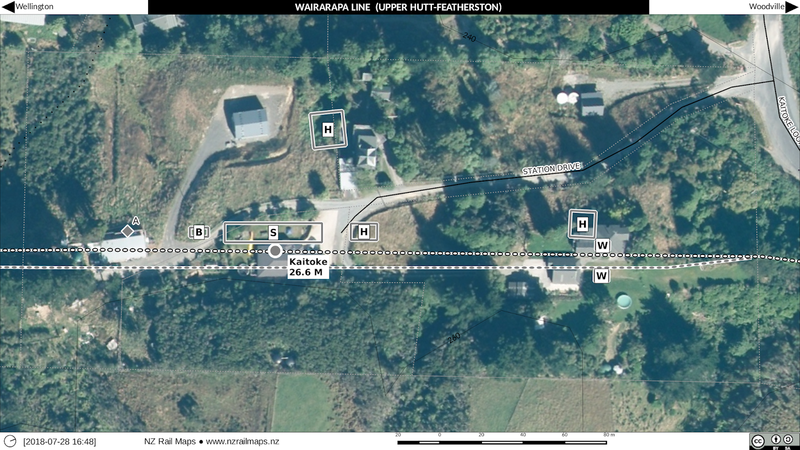 Overview of Mangaroa Station. The original route mileage when opened was "22.08" (I assume 22 miles 8 chains). 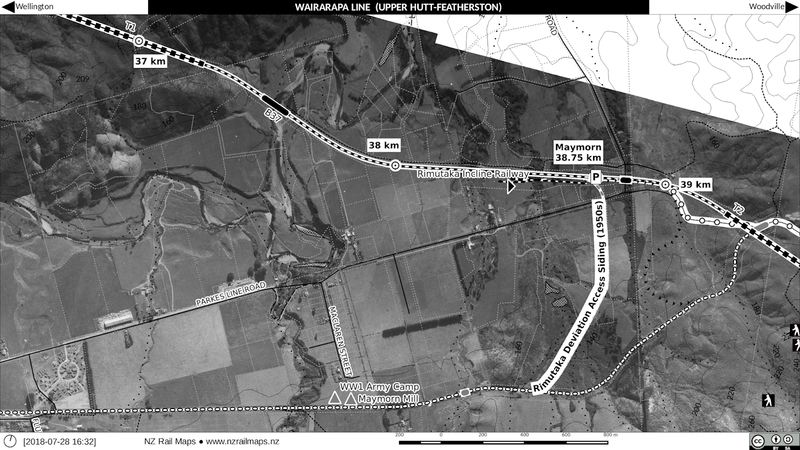 However Upper Hutt was then at 19 miles 53 chains, which distance had been reduced by 1954. 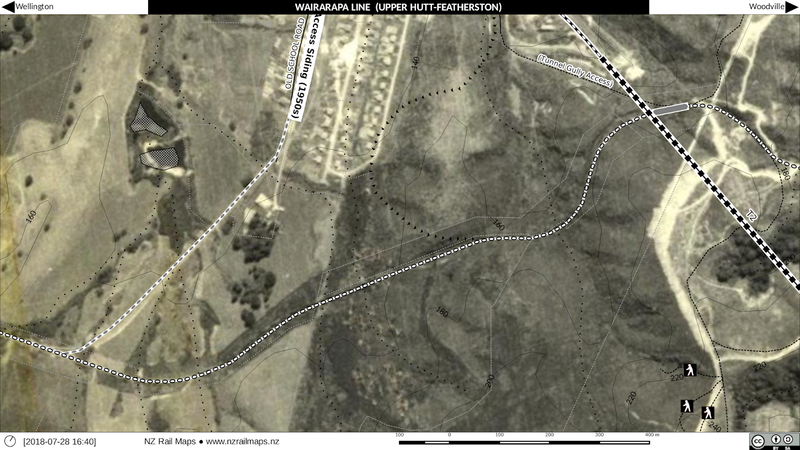 The most notable features in this section being the old WW1 army camp site near a sawmill (the logging tramway ran along behind the houses in the subdivision) and a small bridge. 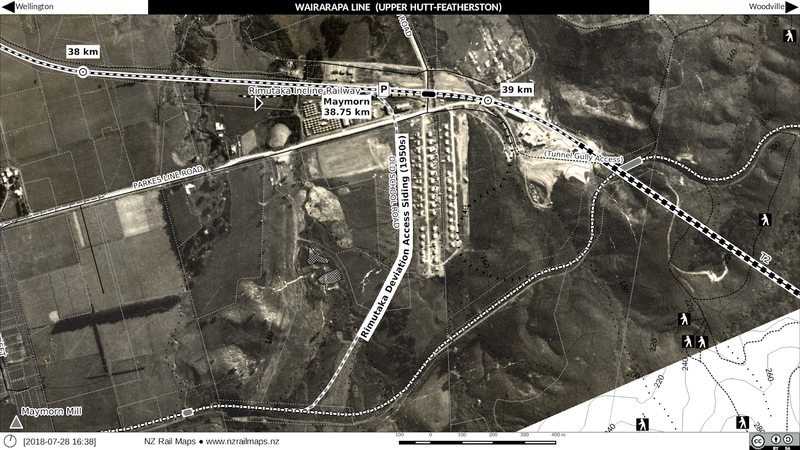 These four maps cover the same area in respectively 1943, 2012, 1958 and 1951. Notable is the present day railway, and the tunnel construction camp in the last two photos. 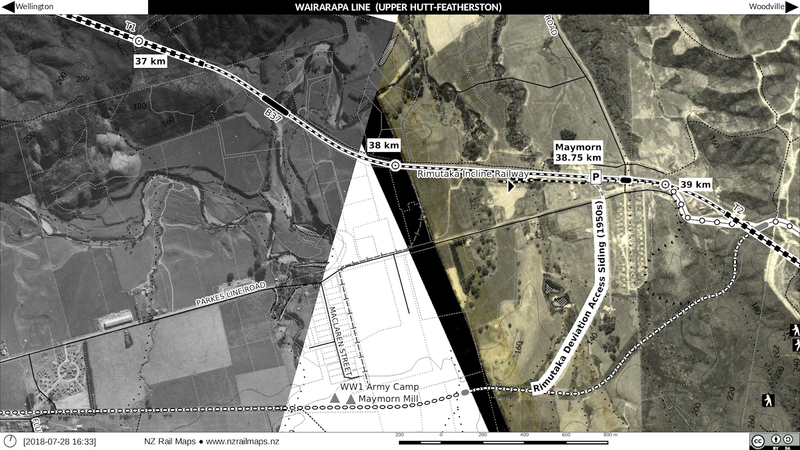 Four maps following the same chronology, of the Rimutaka Tunnel development camp area. 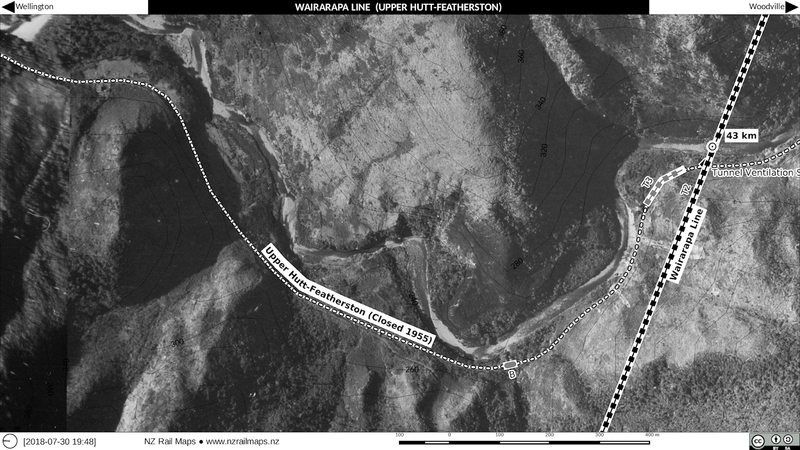 Again with four maps for 1943, 2012, 1958 and 1951, we have the old railway climbing into the hills above the Rimutaka Tunnel. Grades in this section up to Kaitoke maxed at 1 in 40. A pair of Tunnel 2s. 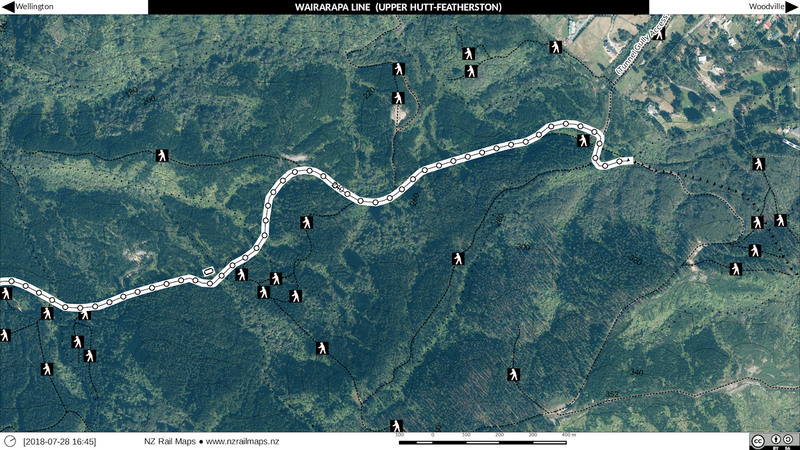 The Rimutaka tunnel and the Mangaroa tunnel are both No.2 on their respective sections of the Wairarapa Line and coincidentally almost parallel. 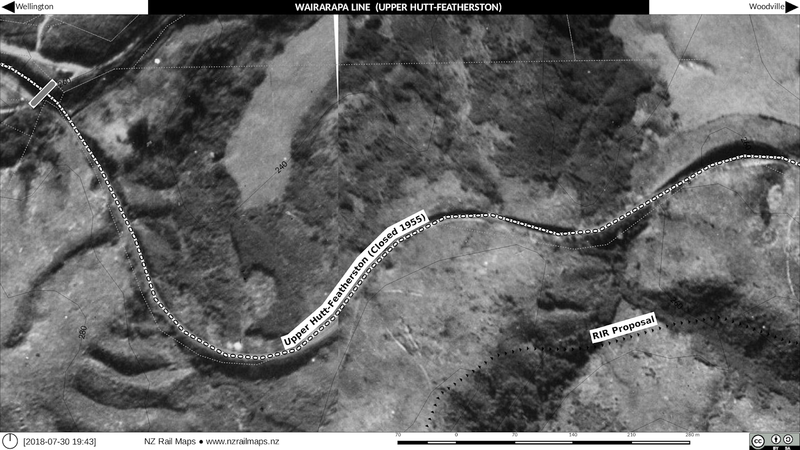 There was a bridge almost above the entrance of the Rimutaka Tunnel and the site of another can be seen on a 90 degree curve due east of the Mangaroa tunnel. 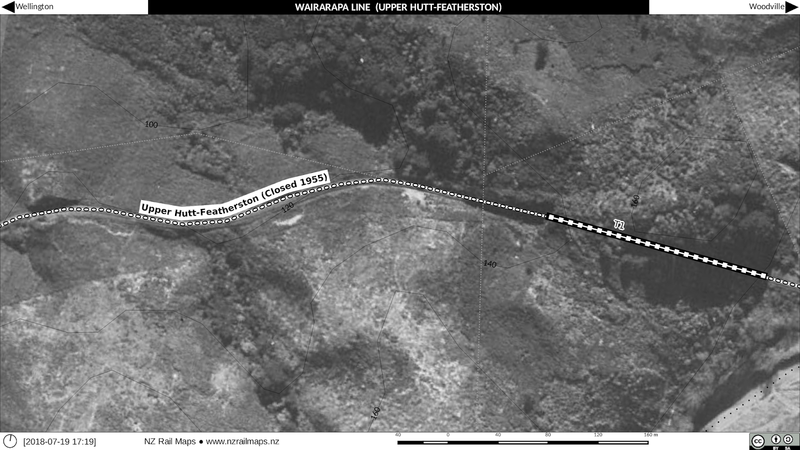 Two small bridges were crossed by the railway in this section. The second bridge near a horseshoe curve may still have the abutments in use today by a footbridge although this bridge is not actually on the cycleway because of its conversion into a road. 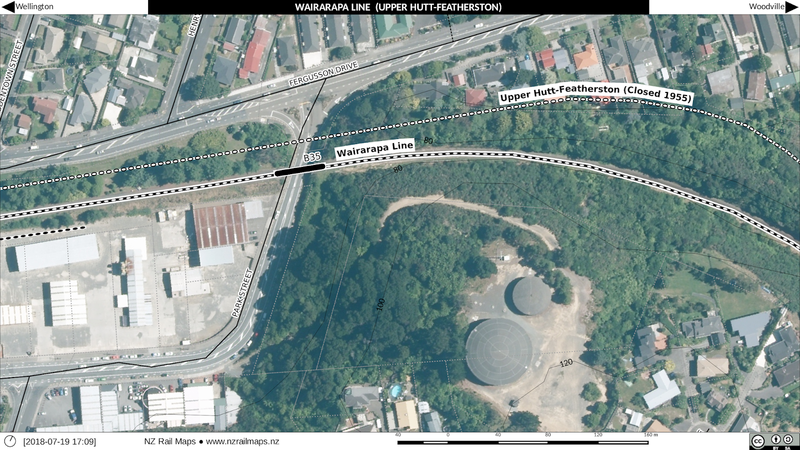 There are a couple of route changes which have bypassed cuttings on the rail corridor. 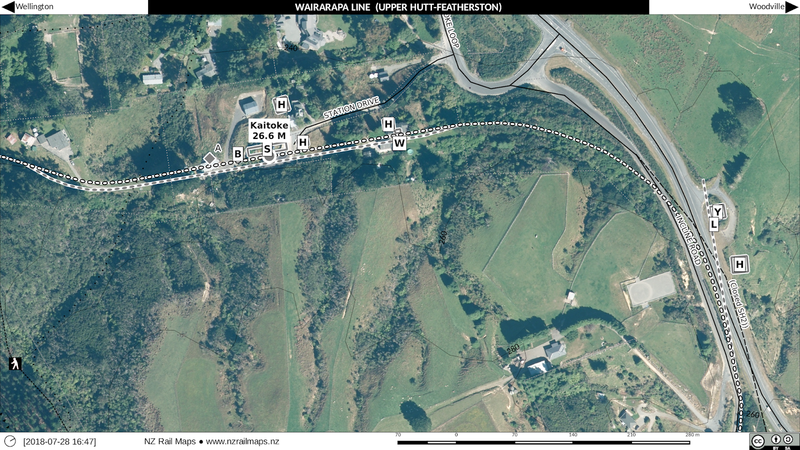 Overview of Kaitoke Station. This was a bit unusual because the goods yard was separated from the rest of the station site. The site of the main station is private property but the goods yard area is publicly accessible although there are no remains of any note today. The main station complex. Some of the buildings including the station itself remained in place for perhaps as much as 50 years after closure but are now gone. Goods yard site. 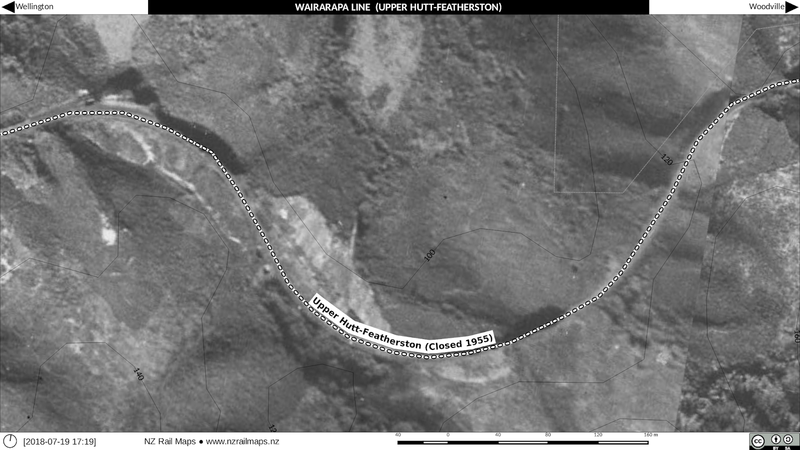 One assumes this was cleared soon after closure with no significant traces left. I have spent a bit of time over the last two weeks looking at resources from the local library. 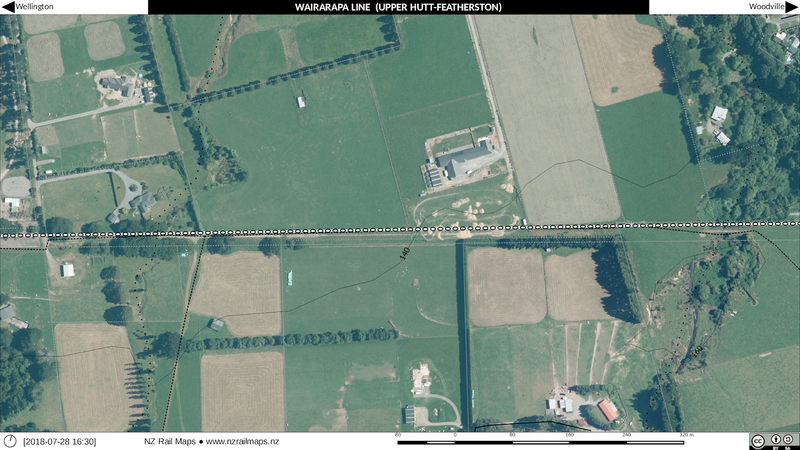 NZRLS over a number of years have published some working timetables of the NZR network and they do contain a lot of detail that can be useful for various purposes. However except for a list of track telephones in an appendix of the timetable they don't list actual route mileages for each route, only for a timetable section. 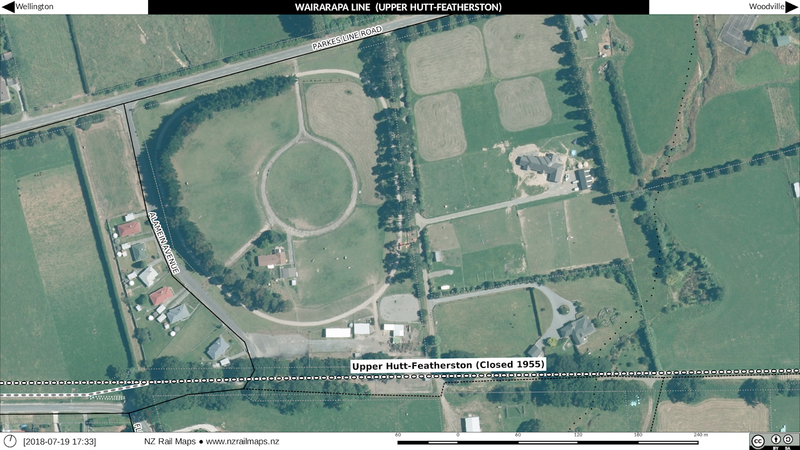 For example from Frankton to Taumarunui the mileage will be shown only starting from Frankton and for going the other way it will be shown from Taumarunui. In other words the actual milepeg measurements from wherever the zero peg of the line are not shown. There is enough mileage detail for me to be able to reconstruct the mileages by putting in the numbers into a spreadsheet or I could actually rely on one of the original imperial editions of the Quail Atlas but I do prefer to use NZR official sources rather than a third party source known to have inaccuracies. There are as it happens some other sources like over the years I managed to obtain way and works district maps showing the extents of each way and works district and these do show how the mileages ran on each line and also show many of the stations. 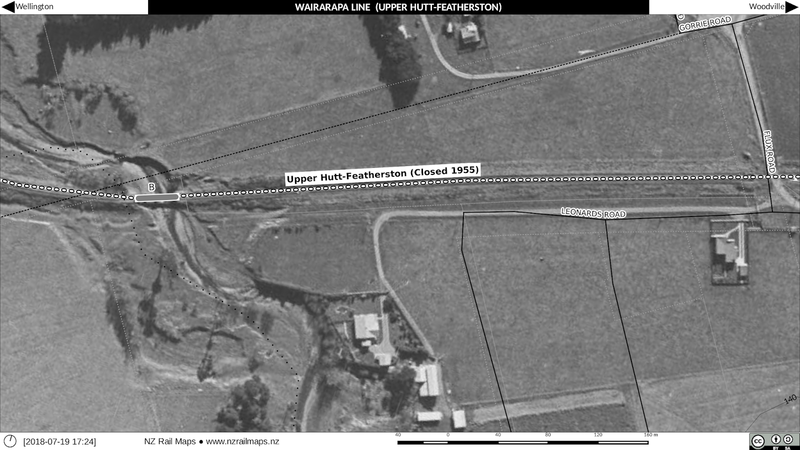 One of the frustrations of the NZRTA is that you do have these gaps because I don't know how they got their mileages in cases where there had been a deviation or realignment but they seem to have managed with stations that must have been closed in 1974 when metrication took place for which there was no metric measurement. The fact is that because we can get an imperial mileage in most cases from the old WTT, we can work out the actual distance from the next nearest station or stations that was open and go from there. OK here is an example, the mileages for the stations on the old NIMT through the middle of Palmerston North are not shown in the Quail 4th edition. 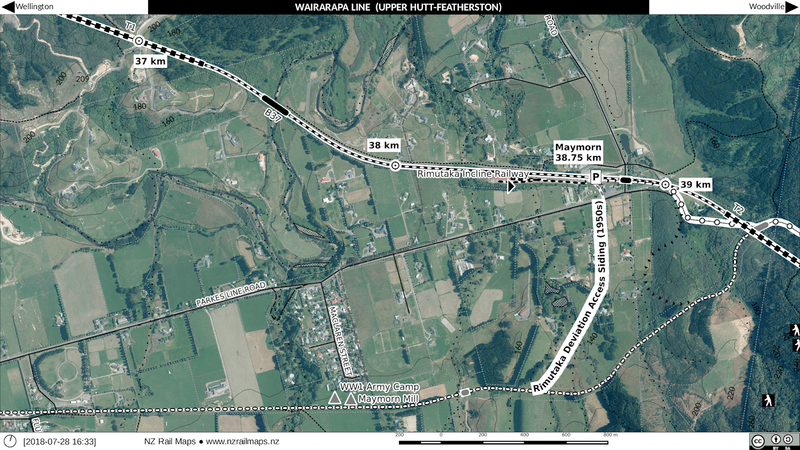 Even showing them in imperial measurements would be OK. Or the mileages on the old Rimutaka line which I have been mapping lately. Using the WTT data I now have I can put in miles-chain measurements for these stations which will appear in the maps because that's the way it should be. However it will be decimal miles to avoid the confusion over the decimal point in the official WTTs not representing actual decimal measurements. So it can be seen it should be really easy to get all the mileages if you have an old enough WTT and it should be possible to have complete measurements on all my maps. 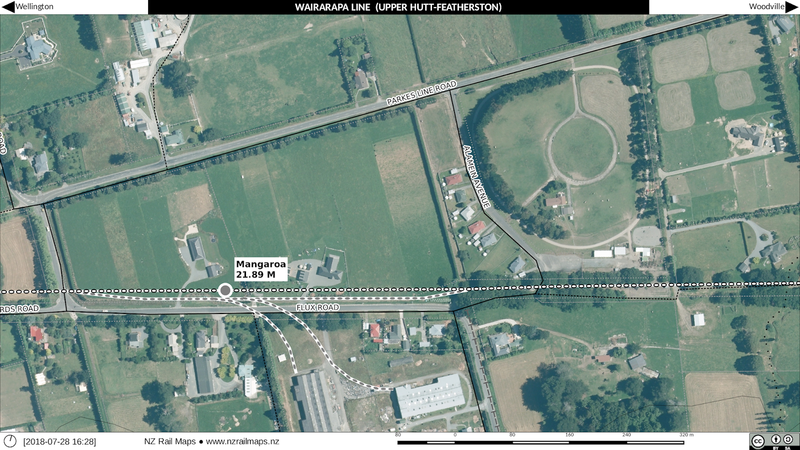 So here are first draft maps for Upper Hutt to Mangaroa. There are a few things to add and fix up before eventually releasing them. 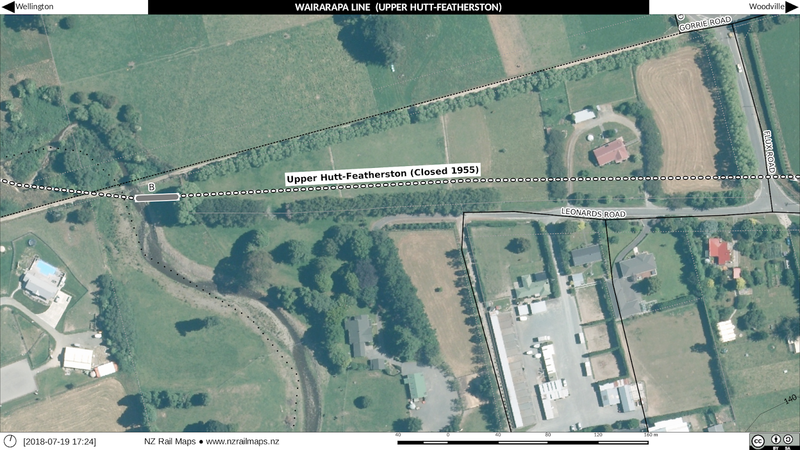 Upper Hutt station has changed a lot in 70 years. The turntable is long gone, the King St level crossing closed many years ago and the yard tracks rather than being for freight operations are now used to store electric units for the Metlink passenger services. 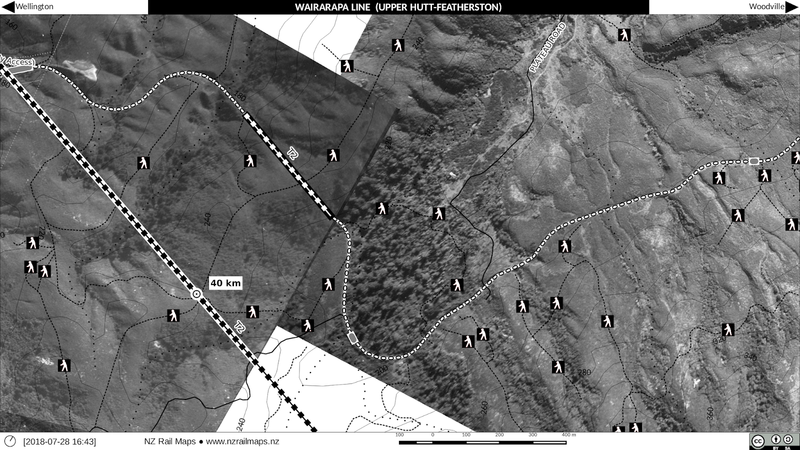 The old line over the Rimutakas started on a 1 in 35 gradient east of Upper Hutt and in the right hand of this map would have already been on that grade. Latterly there was a sawmill east of the old level crossing and sidings did serve these premises but the area has recently been redeveloped further. Here we see the obvious disparity in height between the old and new routes. 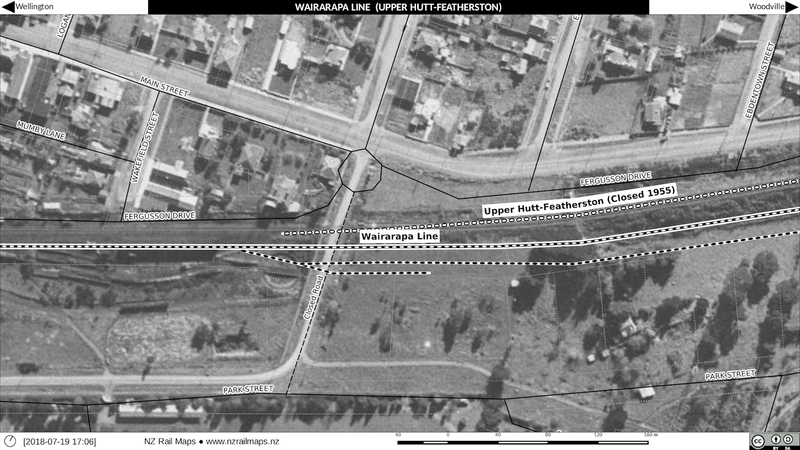 This is harder to appreciate today because the old embankment from Upper Hutt station appears to have been planted over with scrub and possibly lowered in the public reserve, and cut through at Park Street where an underpass was built many years ago. Just when King St crossing closed in favour of Park St underpass is not very clear, but some time between 1965 and 1984. 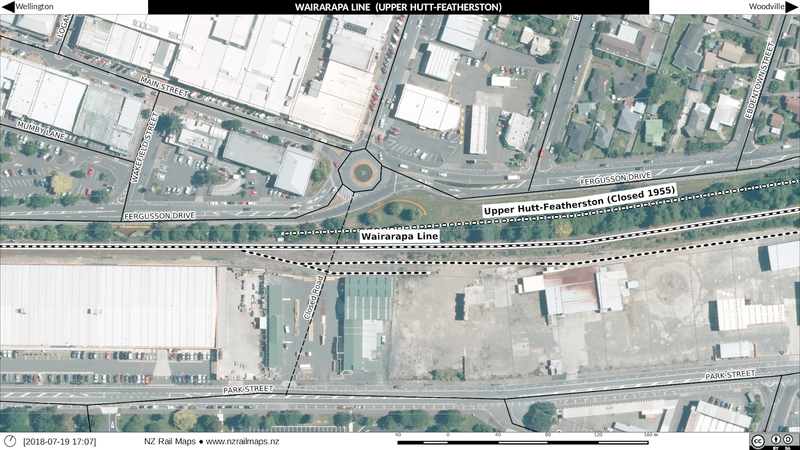 There was certainly no railway bridge over Park St when the deviation was put through. 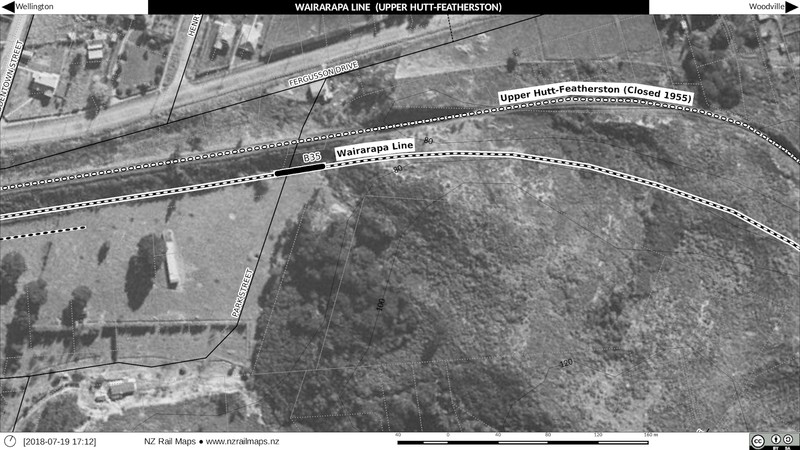 There was enough height difference when the two lines crossed over each other just outside Upper Hutt for a bridge to be required on the old line. 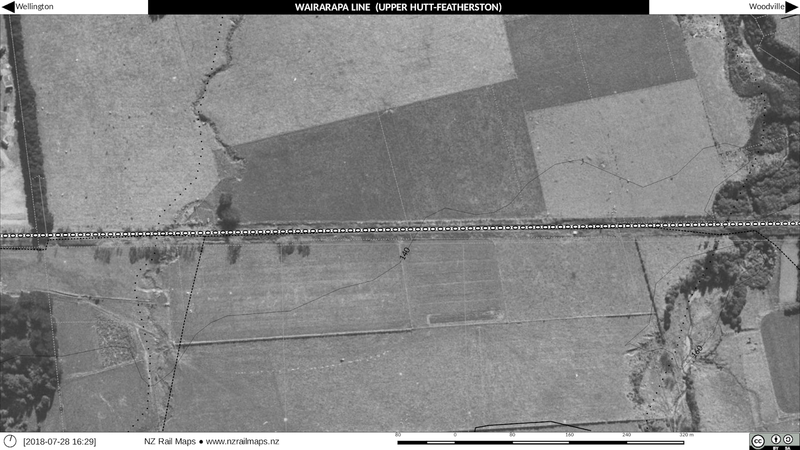 This bridge was only in place for the last three or so years of the deviation works even though the entire project had begun in 1948 and the earthworks further east were well under way by 1951. 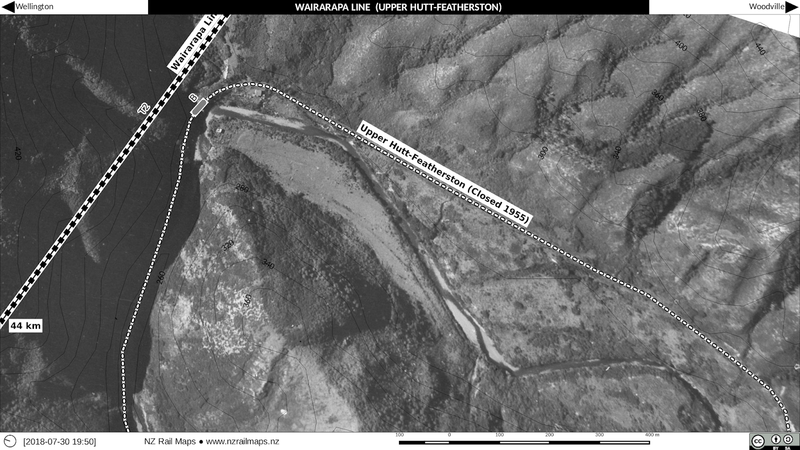 The cutting for the new line was not fully lowered until after the old line had been closed (there was a three day cutover period) and the bridge removed. The embankment at the bottom of the picture was bulldozed some years ago when the area was subdivided for housing. 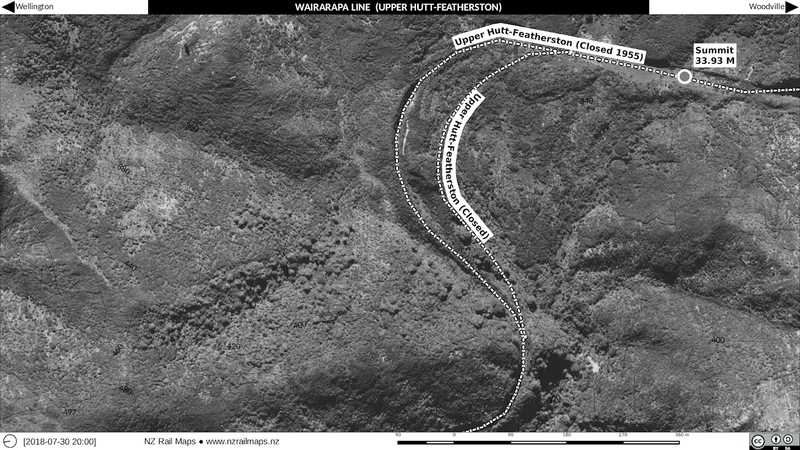 Some of the prominent curves, cuttings and embankments east of Upper Hutt. Much of this remains undisturbed today. 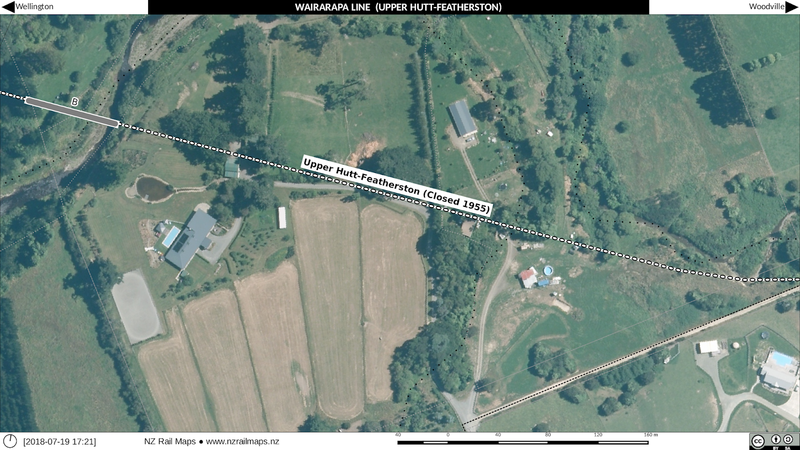 About 1 mile or 1.6 km east of Upper Hutt was the line's first tunnel, known during the construction era as Cruickshank's. This tunnel was around 220 metres long. 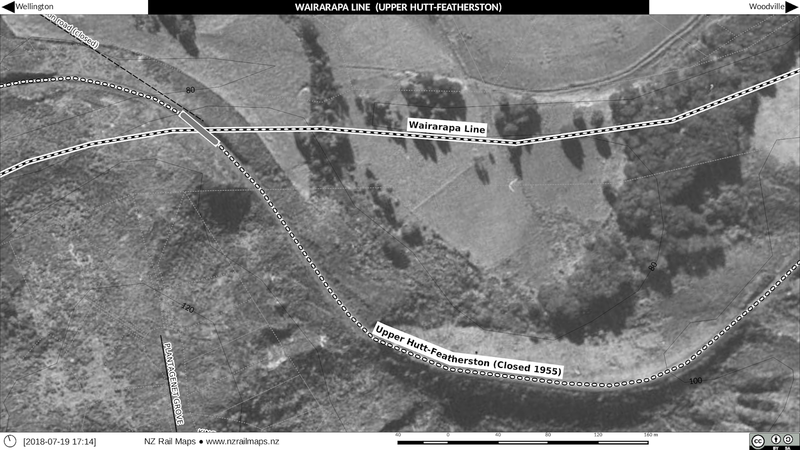 The tunnel still exists today and Upper Hutt Council has constructed an access track to it which can be accessed from Cruickshank Road in Upper Hutt. 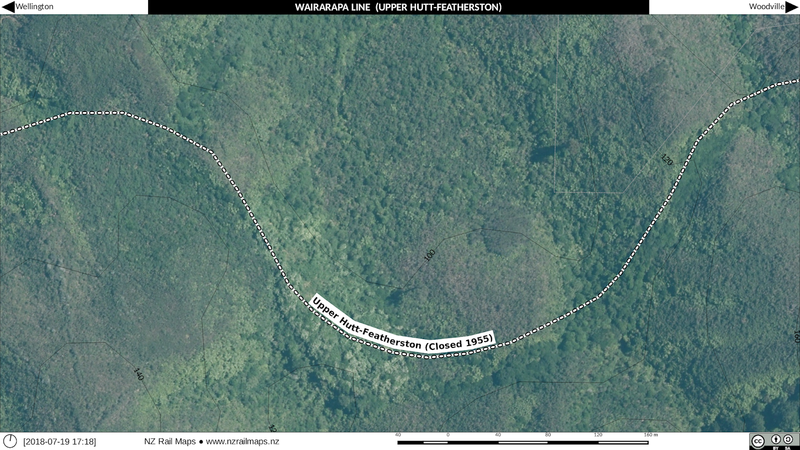 There is no ready access to the railway route between the tunnel and Mangaroa station because of the demolition of the bridge over the Mangaroa River and redevelopment of the area in lifestyle blocks. 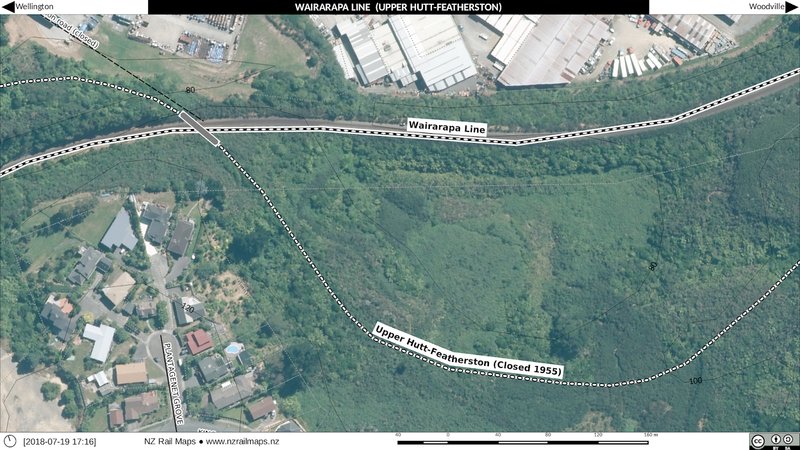 There was another bridge at Cooleys Stream just outside Mangaroa Station. This station was not built when the railway originally opened in 1880, but came into existence several years later. 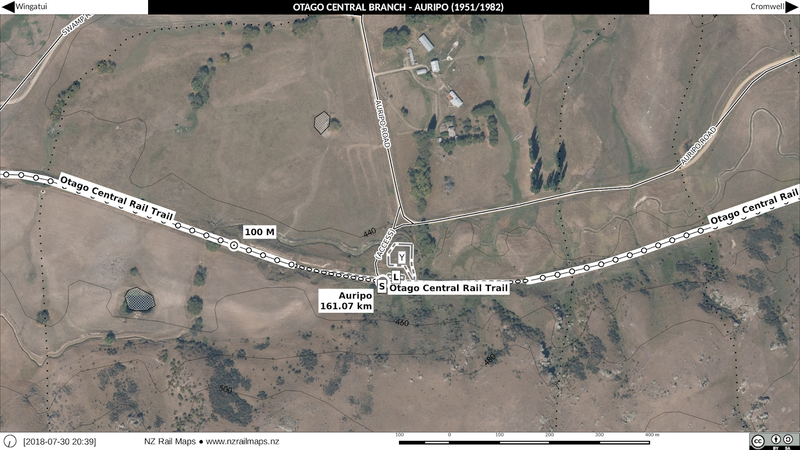 Mangaroa was a small country station for the first 50 years or so of its existence. 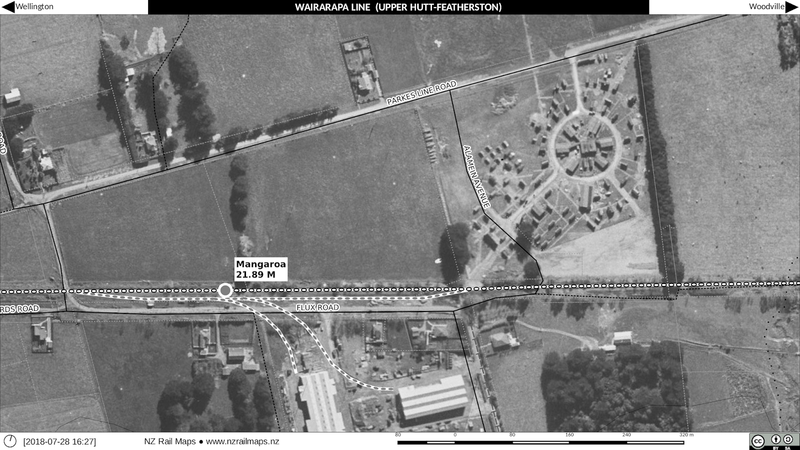 However during the Second World War, the Government decided to establish military bases at dispersed locations outside the major population centres. 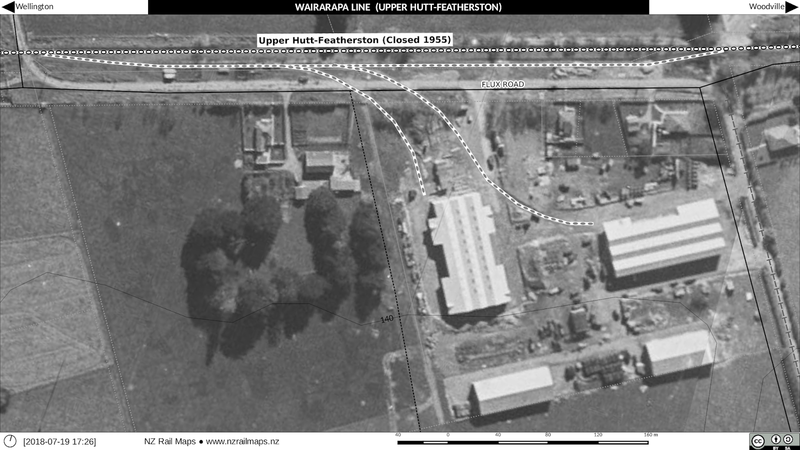 Hence there was an RNZAF stores base built there with sidings. The buildings still exist today and it was not until some years after the war that the site was closed. 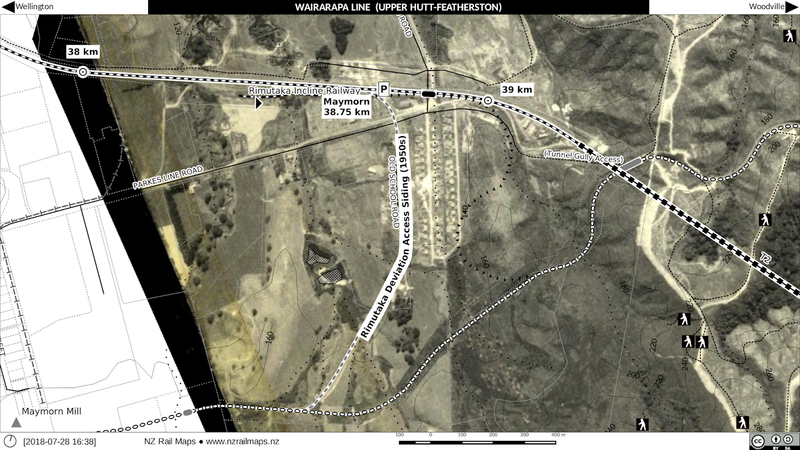 There was also in an earlier era a bush tramway along the line of the side road next to the base. 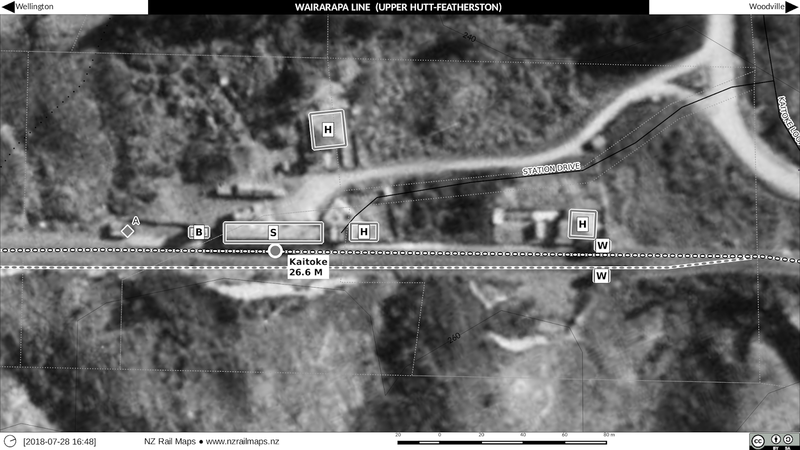 There was also an army base built at Mangaroa during WW2. 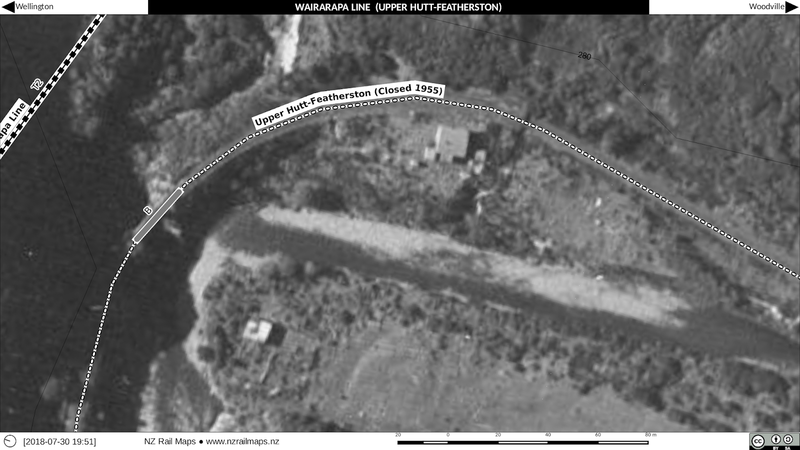 It's not clear at this stage whether this also had its own railway siding or whether they used the Mangaroa yard or air force sidings. 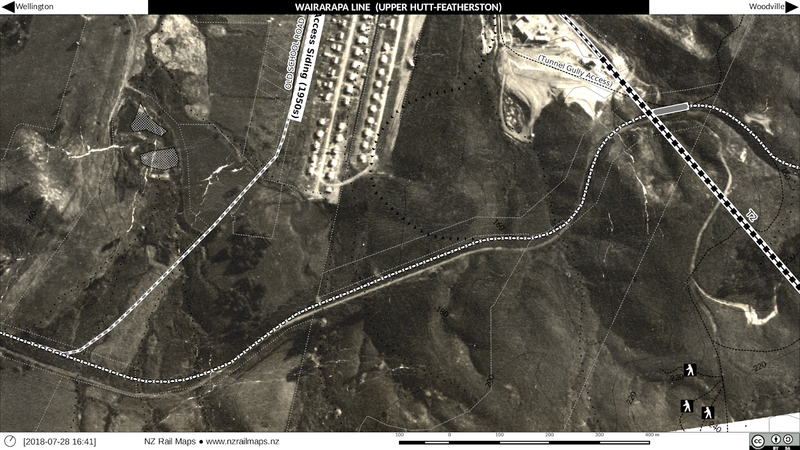 The site is now under private ownership but the perimeter road still exists today. 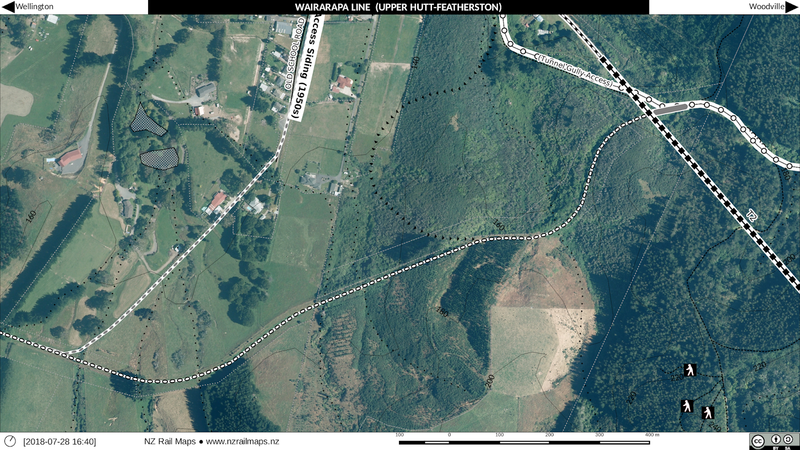 During the First World War there was an army camp further east of Mangaroa and this location will be shown on the next series of maps covering from Mangaroa to Kaitoke.